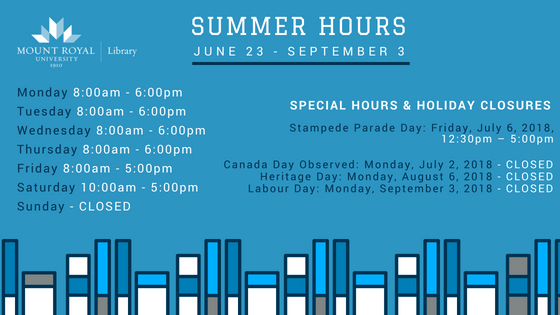 Library hours will change up for the summer starting next week. Please take note of holiday closures and new daily hours from June 23 – September 3. We hope to see you around the RLLC as the weather warms up! The Library has implemented a new library services platform and some links are expiring. Please take the time to update your links to Library resources in Blackboard and in other teaching materials. For more details on how to identify the types of links that will no longer be functional and how to retrieve the new links, please see our FAQ article. To make updates, please do a search from the Library homepage to find your item and retrieve its new link. For assistance, please contact your Librarian; for assistance with a large number of links please contact Susan Wilkinson, Public Services Supervisor swilkinson@mtroyal.ca, 403-440-7217 or visit the Library Service Desk in the RLLC. 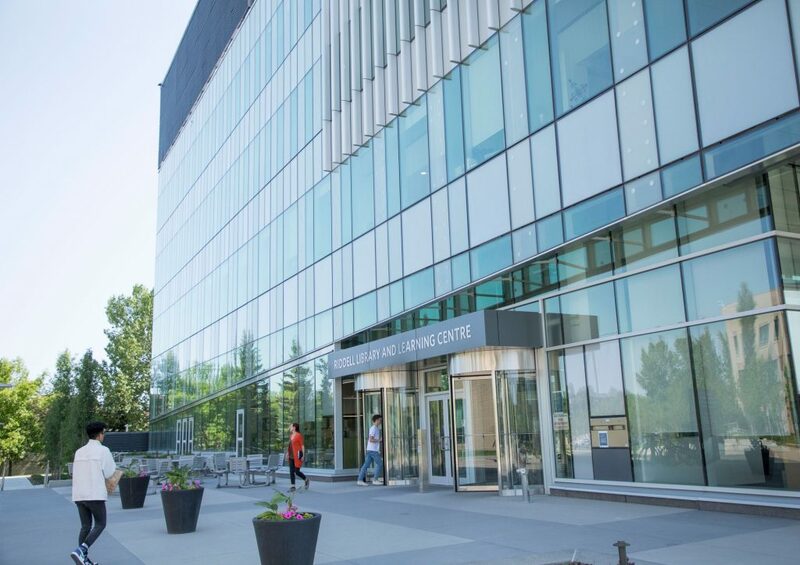 As of June 13, 2018, the Mount Royal University community will have access to Library resources for an entire term and extended loan periods with the help of automatic renewals. 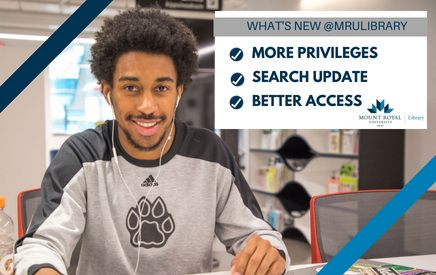 The MRU Library has adopted a new library services platform and with it comes updated policies that complement the needs of students, faculty, and staff. Library users will have access to more collection items for a longer period of time and benefit from an improved process that allows patrons to request borrowed items. The Ex Libris Alma library platform and new LibrarySearch function replaces the Voyager management system that had been in place for close to 20 years. This new cloud-based service not only enhances the look and design of library search web pages, it also allows the Library to lift restrictions to better align with the present-day demands of academics. Additionally, it streamlines daily tasks of Library service staff, providing even more opportunities for seamless access to our resources. “The needs of academic communities have changed in recent years. Updating our library services platform is just one of the many ways we are actively adapting to support scholars here at Mount Royal University,” says Francine May, Associate Dean, Library Collections and Digital Services. Changing needs of users mean policies must also keep up. Maximum fine limits will increase from $15 to $50, laptops can now be borrowed for a longer period of time, and main collection items will have term loan periods. A full list of policy changes can be found on our FAQ page. “We are thrilled these new policies will open up access to our collections and allow us to expand on our mandate to support scholarship and learning,” says May who goes on to explain that Library users will have the ability to submit requests for items on loan, which will ensure their prompt return. Frequent users of the Interlibrary loan service will notice that the sign in, notification, and request process has changed to accommodate this new service platform. Please take a moment to review the new process. The MRU Library is one of many esteemed post-secondary institutions that have recently made the switch to Ex Libris Alma. Harvard University, Simon Fraser University, the University of Manitoba, and the University of Calgary are some of the many institutions from all over the world that have launched the same library management system. 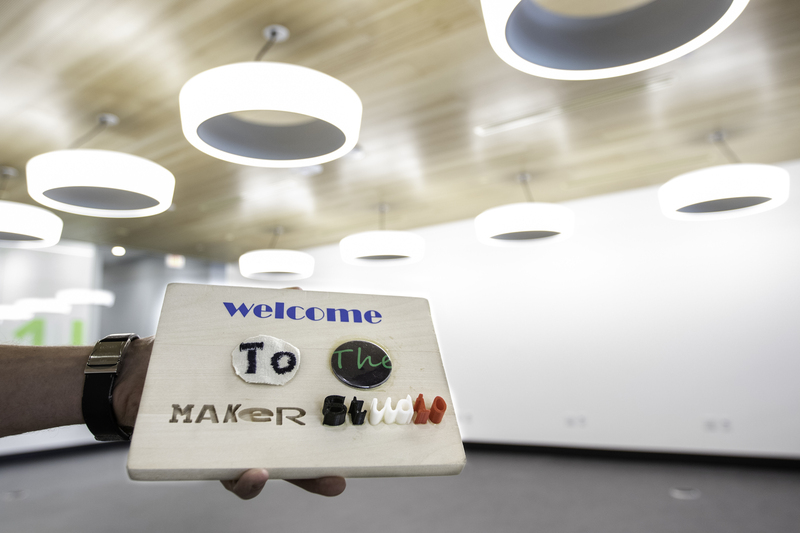 We are excited to share that the Maker Studio will move into its permanent space this week! Library staff members are packing boxes and arranging furniture to move the Maker Studio down the hall to EL1245 (behind the Service Desk). The larger and central space on the main floor of the RLLC will allow us to showcase even more cutting edge equipment and accommodate way more students, faculty, staff, and community members. We’re already working on programming for workshops that will allow attendees to learn a new skill and try out some of the latest design software. The Maker Studio will be closed June 13 and 14 to allow for the move. Your patience is appreciated. We can’t wait to welcome everyone to the new studio.